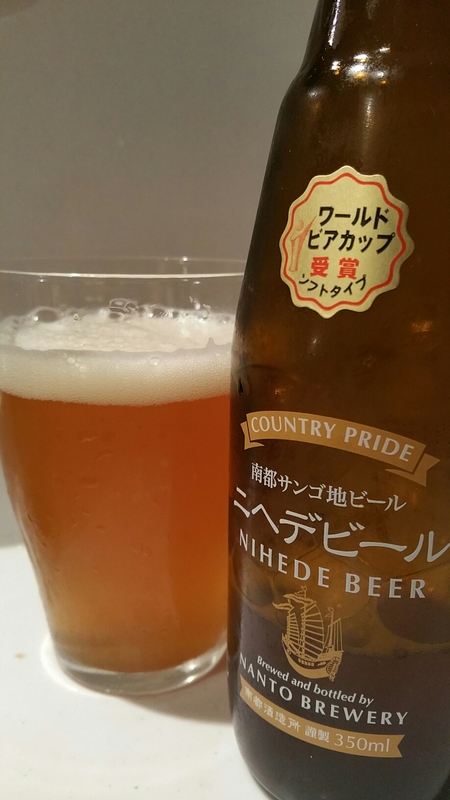 Nihede Soft Type is a kölsch style beer from Nanto Brewery, which explains the soft type nomenclature it has been given. It is also a 5% bottle conditioned beer with the yeast kept in during the bottling process so the flavours may change as time goes on. We’ve seen Nihede Soft Type on draught in local Okinawan bars and at a couple of beer festivals too though its availability is random at best. It won an award for best kölsch at the 2006 World Beer Cup. Don’t be laughing at my soft beer. A strange name – Nihede Soft Type – that still doesn’t make any sense as I sit and write this review. Perhaps kölsch beers are deemed to be softer drinking and easier on the palate but still can’t get my head around the reasoning. The body was a cloudy golden colour which would be the yeast still in bottle though there was no sediment left at the end and I wasn’t warned about any sediment. There most meagre of heads also formed, though it was a blink-and-miss-it experience and what was left was a thin ring around the edge of the glass. Nihede Soft Type was also pretty easy drinking, and not in the way you think. Kölsch beers are supposed to be slightly bitter with a hoppy edge to it but all I got was a malt sweetness when I wanted something crisp and refreshing. It’s nice to drink but the sweetness made this more syrupy than pleasant to drink. One week on, and I am still waiting for the bitterness to kick in. I’m scared to even brush my teeth just in case I miss it. Nihede Soft Type fails to live up to its designated style of a kölsch beer and ends up being something weird.